This page provides background information on how service management processes can be introduced in service provider organizations, and how the YaSM process and document templates contained in the YaSM process model - the YaSM® Process Map - support this task. 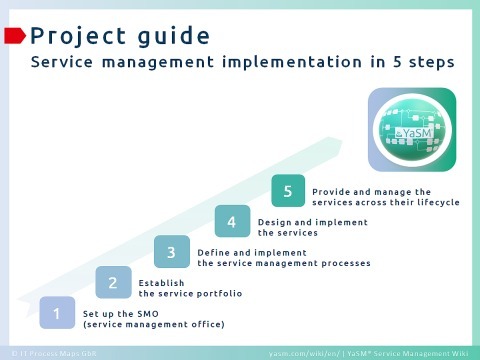 On a separate page you will find the YaSM Project Guide in 5 Steps, describing the typical activities in a YaSM (or other) service management project. At times, service providers try to introduce service management best practice by simply deploying "best-practice-compliant" applications like helpdesk systems or configuration management databases. This approach typically fails to address the real issues and often results in major investments not showing the expected benefits. When introducing best practice, the emphasis should be on defining suitable, effective and efficient processes to make best use of the organization's human and financial resources. Once the processes are defined, it will be possible to select and acquire adequate technical equipment to support the processes. Rather than introducing the full set of YaSM service management processes at once, most organizations will start with a subset. This approach is entirely possible because YaSM is not a standard but a set of recommendations. Users of the YaSM framework are free to adapt the recommendations to their needs and to implement only those parts which deliver the most benefits. The initial motivation for the introduction of service management best practice is in many cases a desire to be able to deal with incidents and service requests more professionally. This requires the availability of a single point-of-contact for the users (often referred to as the "service desk" or "help desk"), where calls and e-mails are received and the necessary steps taken for incident and service request resolution. For this reason, many organizations will often implement the incident and service request resolution process as a first step, supported by the problem resolution process to take care of deeper-running problems. If possible, at least a basic implementation of configuration management should be included, because reliable data on the service infrastructure will significantly improve the effectiveness of incident and problem resolution. Service providers depend on a reliable and secure infrastructure for operating their services. It is thus of particular importance that negative impacts caused by changes to the service infrastructure are avoided, by making sure that changes are introduced in a coordinated way. The second phase of introducing YaSM best practice may therefore seek to establish the change assessment process. The third step is often about creating the conditions for agreeing service levels with the customers and managing service quality. This can be achieved by introducing (elements of) YaSM's service lifecycle processes, plus the service portfolio and customer relationship management processes. YaSM is aligned with ISO 20000 and offers a focused set of processes, policies and document templates which provide a solution for every ISO 20000 requirement. Introducing YaSM processes is thus a straightforward approach for obtaining ISO 20000 certification. The YaSM® Process Map with its process and document templates also provides invaluable support for the creation of high-quality process documentation, which is of particular importance during the certification process. Details: How ISO 20000 relates to YaSM service management. Because it represents a wealth of service management know-how at a cost comparable to a small number of consulting days, the YaSM® Process Map enables small and medium-sized businesses (SMB) to benefit from established best practice principles. In our opinion, best practice frameworks are not only suitable for large businesses, where extensive resources are available for implementing and operating a large number of processes. Rather, the guiding ideas behind service management best practice are valuable for businesses of all sizes. The important point is not to try to implement the complete range of processes, but to concentrate on those parts of the recommendations which are most beneficial and relevant. Correctly implemented, YaSM will not create additional work: The reason for the great success of service management best practice lies in its proven contribution to more economical working practices. Notifications of service interruptions have always been reported by the users and resolved by the service provider. It has, however, become common wisdom that a technical specialist does not have to be engaged for the elimination of every interruption: Simple issues can in many cases be resolved by 1st level support agents, allowing the specialists to focus on their primary duties. (See also: description of the the incident resolution process). The problem resolution process is also about avoiding unnecessary work: Broadly speaking, it seeks to identify and eliminate root causes behind frequently occurring service interruptions (incidents), in order to minimize the number of incidents to be dealt with in the incident resolution process. The introduction of a problem resolution process does not necessarily need to involve the hiring of an additional problem manager. It is rather a matter of someone being made responsible for the identification of problems, and for the coordination of activities to resolve the problems. It may be appropriate to combine the incident manager and problem manager roles into one. The change assessment and coordination process ensures that any changes to the service infrastructure are carried out in a coordinated way. Assessing planned changes before their implementation is beneficial in most organizations because dealing with the unintended side-effects of uncoordinated changes can be very difficult and time-consuming. The effort involved in assessing and coordinating changes typically depends on the size of the organization, so this task is usually less extensive and therefore more easily accomplishable for smaller and medium-sized service providers. The role of change manager can perhaps be assigned to a line manager from operations. The implementation guide and the YaSM® Process Map provide a wealth of knowledge for organizations that engage in introducing service management best practice, and most of our customers experience that our process model enables them to get started on their own. It should also be noted that reorganization projects tend to fail if they are driven mainly by external advisors. Ultimately, success can only be secured if all internal staff is closely involved, so there is no real alternative to taking the introduction of best practice principles into your own hands. This notwithstanding, it is at times a good idea to call upon the support of a competent advisor, especially when dealing with certain topics in detail. Project blueprint and process templates for efficient YaSM implementations. Clearly structured and detailed process diagrams explain how YaSM works and do away with the need to sift through numerous books on service management best practice. The diagrams and all documents included in the YaSM® Process Map are also fully customizable. This means that, instead of starting with a blank page, service providers are able to define their processes by adapting a set of professionally designed templates. This saves a significant amount of time and effort. The method of "Service Management Implementation using the YaSM® Process Map" combines a project blueprint with ready-to-use templates to ensure a successful and efficient enterprise service management or ITSM initiative. Please refer to the project manual for a description of the typical activities in a YaSM (or other) service management project. → Proceed to the project guide: "How to implement service management in 5 steps".